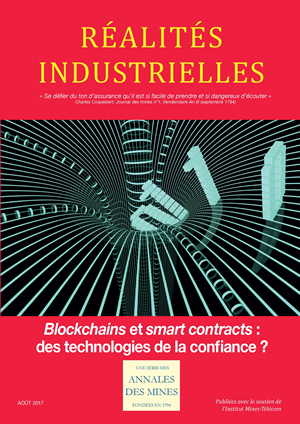 Réalités Industrielles - Août 2017 - Blockchains et smart contracts : des technologies de la confiance ? Août 2017 - Blockchains et smart contracts : des technologies de la confiance ? Rotterdam School of Management and Copenhagen Business School. The intelligence of an information network is augmented by its functionality (its ability to distribute, store, assemble, or modify information). Transmission networks are technically complex, but business-wise they are “dumb” pipes that transport information without enhancing it. An information network augmented by formalized business relationships can be “smart”; it can improve the utility of information in multiple ways (that is synonymous with creating economic value). Conversely, a lone transaction between two business partners rarely stands isolated, especially in an electronic commerce context, but the economic value accrues already then for both partners. New transactions can be created with the same or other partners, by cascading whole or parts of the same initial transaction, thus building a network of business relations which develops over time. To address the two above paradigms, has been defined the concept of “Smart Business Network” (SBN). August 2017 - Blockchains and smart contracts: The technology of trust? Agosto 2017 - Blockchains y smart contracts, ¿tecnologías de confianza?